Belli's grocery is the second confirmed retail space at Thalia Hall. 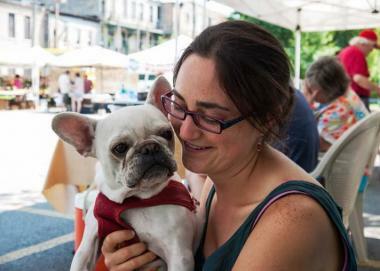 Pilsen resident Alex Curatolo — who named the store after her french bulldog — got the idea for Belli's after her work with Pilsen's community farmers market. PILSEN — Belli's, a grocery store with locally grown produce and a juice bar, will become the second shop to move into the recently relaunched, 32,000-square-foot Thalia Hall. The idea for Belli’s came as Pilsen resident Alex Curatolo was putting together a business plan to get nonprofit status for the Pilsen community farmers market. As she worked on the plan, the 26-year-old said she realized that those same farmers market vendors could use a permanent storefront to sell their goods year round. “It’s going to expand their market to more of an everyday opportunity,” Curatolo said of the vendors. Belli’s — named after Curatolo’s French bulldog — will sell locally-grown produce, jams, honey and other locally-made products, in addition to having a juice bar serving fresh juices and smoothies. Thalia Hall in Pilsen was built in 1892 in what was then a Czech neighborhood. 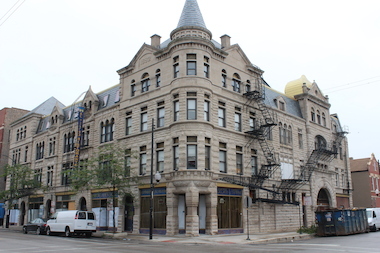 Modern Cooperative, a Pilsen vintage furniture shop, is also making the move to Thalia, a massive structure on 18th Street that was built in 1892 in what was then a Czech neighborhood. “To be able to walk next door and get organic produce and a smoothie — it’s kind of my health food dream come true,” said Modern Cooperative owner Tiffany Paige. Paige said Sept. 13 would mark Modern Co-op’s grand opening at Thalia. And while Belli’s should open its Thalia storefront at 1215 W. 18th St. in early October, Curatolo said she’s already received a warm response from many Pilsen business owners. Bruce Finkelman, the owner of the Empty Bottle night club and the Longman and Eagle restaurant, is part of a group that bought Thalia Hall for a reported $3.2 million in June. Finkelman has said that he intends to open a new tavern and restaurant in the building.